A Warrior’s Wish® supports the long-term goal of hope beyond recovery through financial grants awarded to severely injured service members, veterans, their families and families of the fallen. Whether it is adaptive equipment, tools for a hobby or business, or family bonding experiences, A Warrior’s Wish collaborates with the community to make Wishes come true for our warriors and their families. 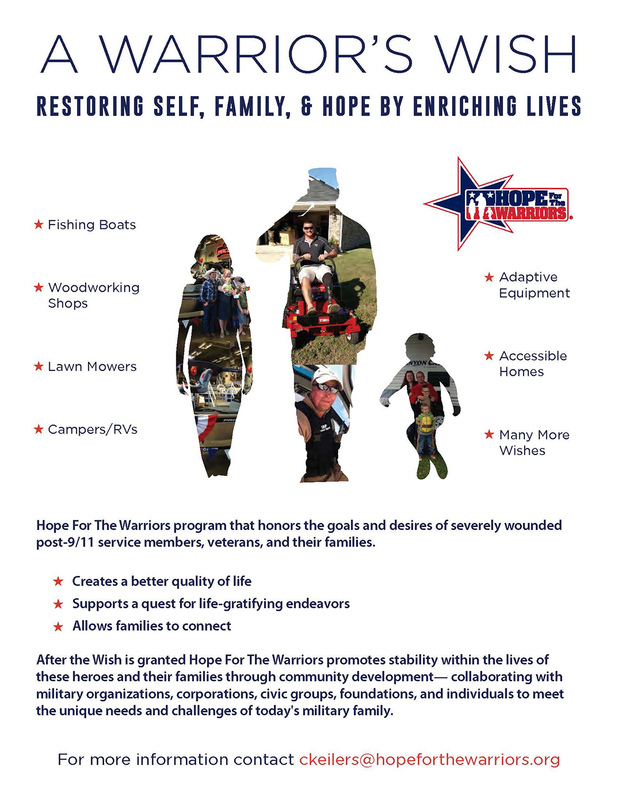 For more than a decade, Hope For The Warriors has been dedicated to restoring a sense of self, family and hope for veterans, service members and military families through a variety of programs including its first one, A Warrior’s Wish. A Warrior’s Wish honors the goals and desires of severely wounded service members, veterans, and their families. Wishes fulfill a desire for a better quality of life or support a quest for life-gratifying endeavors for post-9/11 service members, their families, and families of the fallen who have sustained physical and psychological wounds in the line of duty. FUN FACT: As of December 2018, we have granted nearly 200 Wishes since the program’s inception. For more information about the program, how you can partner to fulfill or sponsor a wish or have questions about applying, please contact Chrystal Keilers (832) 776-9379,ckeilers@hopeforthewarriors.org. Along with sponsorship opportunities, we are seeking in-kind donations and volunteers. A Warrior’s Wish® is application period for 2019 is closed and we are currently underway granting approved Wishes. If you have been assigned to A Warrior’s Wish Program to apply for a Wish to be considered in 2020, you will receive the application packet emailed directly to you mid-2019. Beyond meeting immediate physical and emotional needs, A Warrior’s Wish fulfills a desire for quality of life beyond recovery and a quest for life gratifying endeavors. Examples of past wishes enhance one’s quality of life through tools/equipment for hobbies and family activities. Due to a limited program budget and program goal to grant as many wishes as possible, our policy does not permit us to fund automobiles, houses, or home modification projects. Wishes must not compromise moral and ethical standards of behavior as defined by the organization’s board of directors (BOD). We partner with the Gary Sinise Foundation to support home accessibility projects. If interested click here to learn more. At this time A Warrior’s Wish policy states that in order to meet the minimum eligibility requirements, one must have sustained combat injuries AND be considered severely wounded as defined by the DoD’s definition which includes but is not limited to loss of limb, sight, and/or hearing, TBI, PTSD with co-occurring problems (disorders), spinal cord injury, or severe burns. Other factors considered include the impact on the activities of daily living for the service member. Common diagnoses include an amputation, shrapnel wounds, gunshot wounds, VA rating of 70%+ for PTSD with major depressive disorder, VA rating of 70%+ for TBI, etc. Common causes of injury include wounds resulting from the following: IEDs, mortar attacks, firefights, psychological trauma, etc. What types of documentation will be requested? One of the greatest gifts one can receive is the gift of Hope. Through the most difficult time in my life, it was hard to find Hope. Hope For The Warriors® gave me that gift. They continue to stand by my side through my journey and at my weakest points they remind me what Hope is all about. Because of Hope For The Warriors, I now give Hope to others.